The 2017 NRL season is upon us again. This is significant to me, because 50 years ago, I started my love affair with rugby league. This season is our golden anniversary. It began as a seven-year-old kid, when I’d accompany my Dad to games. We didn’t have to go too far, as I grew up about two blocks away from Jubilee Oval, Kogarah. Yes, the relationship with rugby league is closely tied with the St George Dragons – now the St George Illawarra Dragons. I have seen some amazing changes over this half-century, and I remember so much about different aspects of the game. So without any further ado, let me unwrap a few memories for you. When I was growing up in the 1960s, there were 12 Sydney-based teams, which formed the NSW Rugby League Football Clubs Premiership. Sure, rugby league was played elsewhere in NSW and Queensland, but in my early years, they were seldom mentioned unless a player outside of Sydney was selected for Australia. While Newtown became the Jets in 1973, they were originally called the Bluebags, after the bags that the blokes carried around Marrickville and Newtown during the Depression, commonly known as a ‘swag’ or ‘bluey’. It also refers to the sugar bags from which the jerseys were cut out and dyed blue. In time, Newtown were dropped, and North Sydney merged with Manly to become the Northern Eagles. After the demise of Super League, the two clubs went their own way and the North Sydney Bears re-emerged in today’s NSW Cup competition as the reserve grade side for South Sydney. Newtown is also present in today’s NSW Cup as the feeder side for Cronulla. Each club had three grades: first grade, reserve grade (which is now the NSW and Queensland Cups), and third grade. Third grade evolved into U-23s and then eventually become the National Youth Competition for under 20s. This also made up the overall Club Championship, where the results from the games of all three grades, plus the for and against, percentages and aggregates, were just as important as the competition points tables. I remember each Friday, then the following Monday, defunct evening paper The Sun would publish the competition table for all three grades, plus the all-important Club Championship, where one club would emerge as the NSWRLF Club of the Year. Today, the Club Championship still exists, but very much in the background, stripped of the prestige it enjoyed during my early years. The clubs competed for the JJ Giltinan Shield, like today, although there was more prestige to it back then. From 1951 (well before my time) the Shield was awarded to the NSW Rugby League premiers. It was the prime trophy, even when the Wills Cup (1960-1981), Winfield Cup (1982-1995) and Optus Cup (1996) were awarded. 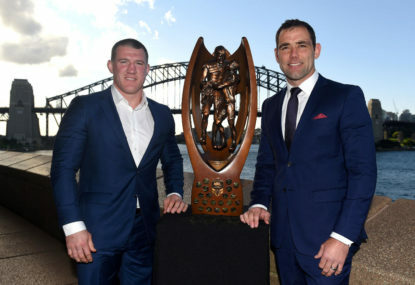 To a long-time Dragons supporter, the JJ Giltinan Shield is special, as St George won 11 straight premierships – a feat that was recorded in the Guinness Book of Records, and has never been repeated. There is a replica of the famous shield in the foyer of St George Leagues Club today. Have other Roarers some great memories as well?